have the right to cast their votes. This even includes exchange students (e.g. Erasmus programme students)! Which bodies can you vote for? the student representatives (Studienvertreter*innen). Here you can cast your vote for up to 5 persons. The elected people will be your representatives at the Faculty of Informatics, e.g. deciding on changes on the Curricula. the representatives on university level (in our case HTU). This part is a vote by list. Work at HTU includes for example the departments for Culture, Sports, Students from Abroad. Also representatives at this level can influence the University as a whole. the representatives on the federal level (ÖH Bundesvertretung). This, too is a vote by list. ÖH Bundesvertretung works together with the Ministry of Science, Research and Economy, e.g. on the federal budget for all universities in Austria. The 4th level - "Fakultätsvertretung" consists of students selected by the student representatives for Informatics, Business Informatics and Informatics Teacher Training (Lehramt). The federal representative body has compiled brochures containing the most important information regarding the elections also in Turkish, Serbian/Bosnian/Croatian and Slovenian. 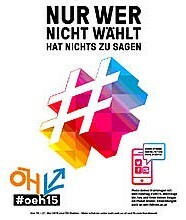 The brochures can be downloaded at the website of ÖH Bundesvertretung.